On the radio, your favorite band may include a bunch of scruffy musicians. But on your wireless network, your band is full of channels. Your choice of band and the channels it contains can have a big impact on the network’s performance. What is a wireless band, anyway? Radio signals are electromagnetic waves, part of the same electromagnetic spectrum that includes light and x-rays. All waves vibrate at a particular speed or “frequency,” measured in Hertz (Hz); a billion Hertz equals one GigaHertz (GHz). Radio waves are defined as a specific part of the slow end of this spectrum, called the “radio band.” To avoid interference between different uses of the radio band — broadcast radio, broadcast TV, GPS, emergency communications — the U.S. government divides it into smaller divisions, also known as bands. Most consumer devices that emit a radio signal — wireless routers, cordless phones, cell phones, garage door openers — operate in the ISM band, short for industrial, scientific, and medical. This band was cordoned off decades ago because such devices don’t need to broadcast very far and therefore (theoretically) won’t interfere with one another, and thus don’t need to be licensed and confined to a specific frequency, like a radio or TV station. The ISM band extends from 2.401GHz to 2.473GHz, but people call it the 2.4GHz band for short. Today, tons of devices operate in the 2.4GHz band and, as a result, cause lots of interference with nearby ISM-type devices. In an effort to prevent this from occurring, the 2.4GHz spectrum is split into 11 “channels” (small bands), each 22MHz apart. In theory, these channels provide three frequency ranges whose signals never overlap. Or, to put it another way, three 2.4GHz devices using three different channels should never interfere with one another. Fortunately, there’s another option: a different band known as the Unlicensed National Information Infrastructure (U-NII) band, called 5GHz for short. 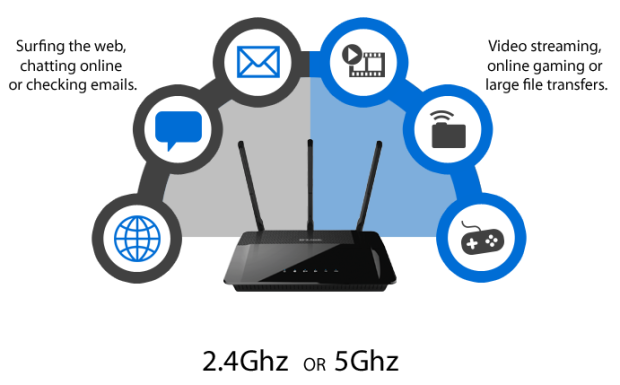 Dual-band wireless networking equipment supports both 2.4GHz and 5GHz operation. 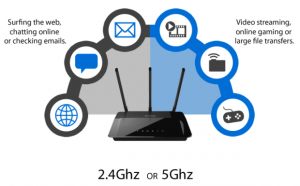 Devices that support the Wireless AC (802.11ac) standard can move up to the higher-frequency band to take advantage of additional channels that are less prone to interference than 2.4GHz. Be aware that there is a trade-off for minimizing interference. Because they operate at a higher frequency, 5GHz signals have a shorter range than their 2.4GHz counterparts.